Reading up on altitude sickness and how it randomly can strike someone freaked us out a little before we went. We spent hours researching and reading up on everything we could about altitude sickness – it wasn’t going to ruin such a huge chunk of this Peruvian adventure. So we understood that there is less oxygen at higher altitude and symptoms of altitude sickness included light headedness, lack of appetite, nausea, drowsiness and shortness of breath on exertion. One friend gave the advice: “Don’t let your head dip below your heart”. Others were telling us just to take it slow. So we heeded their advice when we landed in Cusco (approximately 3,400 m.a.s.l). There would be NO exertion whatsoever. So walking to the carousel to pick up our luggage, we were probably taking one step every second. Maybe we were being extreme but we were not jeopardising our health being frantic unnecessarily. We did have a few people at the airport and approach us and ask whether we needed a doctor, which we thought was very amusing. Our transfer guide instructed us to relax in our rooms for at least 2-4 hours before actively exploring the city and to also dose up on coca leaves or coca tea. Little did we know that coca leaves derive cocaine. Thank goodness we didn’t bring back the delicious teas and lollies! But they certainly worked a treat for suppressing any symptoms of altitude sickness. Now to explain some of the symptoms, let us give an example. There was one day where we walked up 10 steps (or so maybe) and when we got to the top, we were so out of breath that when we talked, the words came out as if we were spluttering from crying. It was the weirdest sensation ever. It took twice as long to get a sentence out because we were catching our breaths…. The highest altitude we reached was at La Raya on the train from Cusco to Puno where it was about 4,300 m.a.s.l. And getting off the train and back on the train was exhausting, not to mention the temperatures at this height was windy and freezing. And Lake Titicaca is the highest navigable lake in the world at approximately 3,800 m.a.s.l. and we were able to sail on it! Well, more like speed boat to Taquile Island and Uros. Uros are the floating islands – the islands built on totora reeds. This is our biggest highlight in Peru! The population is about 1000 people and there are homes and schools and about 5-6 families per “island”. We saw their homes and how they lived and even got a trip between the islands on a reed boat. To our surprise, we heard that some of them had satellite TV hooked up to their reed homes. 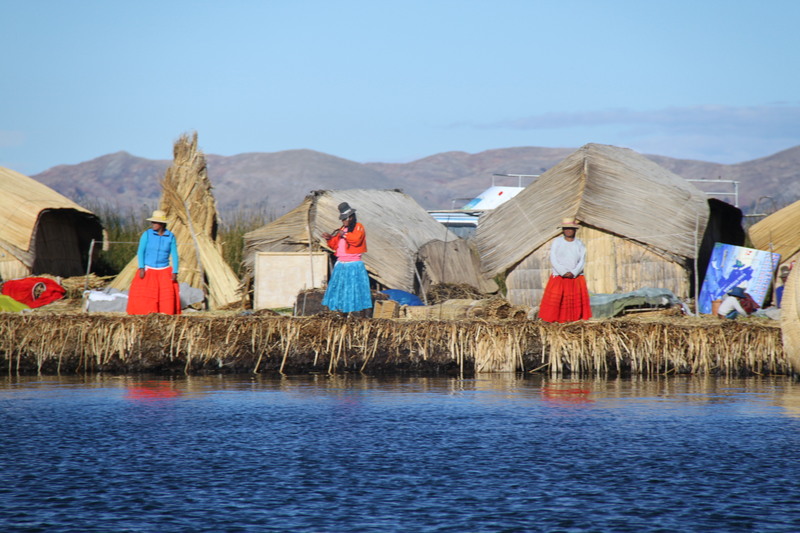 Visiting the Uros Islands is one of our favourite all-time travel experiences. This was a very cool way to finish our time in Peru. The Peruvian people are so warm and welcoming and we are blessed to have had the opportunity to visit this country. This entry was posted in Peru, South America and tagged Altitude, Altitude sickness, Coca, Lake Titicaca, Peru, Puno, Taquile Island.